I’ve spent the past few weeks learning how to build scenery for the neXt simulator. If you haven’t tried neXt I highly recommend giving it a shot. It is, without a doubt, the most realistic RC heli simulator I’ve ever used (and I’ve used all of the top applications). It is so good that I decided it was worth my time to try to recreate our local flying field in the simulator. The developer provided some basic documentation for the process, but there were a lot of gaps to fill (due to my inexperience with Blender, mostly). I had never taken proper panoramic photos. I didn’t even know what a panoramic tripod head was. Cut to today… I built my own panoramic head (I’ll blog about this soon), I’ve gotten good at creating panoramic photos, and I can work my way around blender pretty well (at least for the purposes of creating a proper 3D scene). 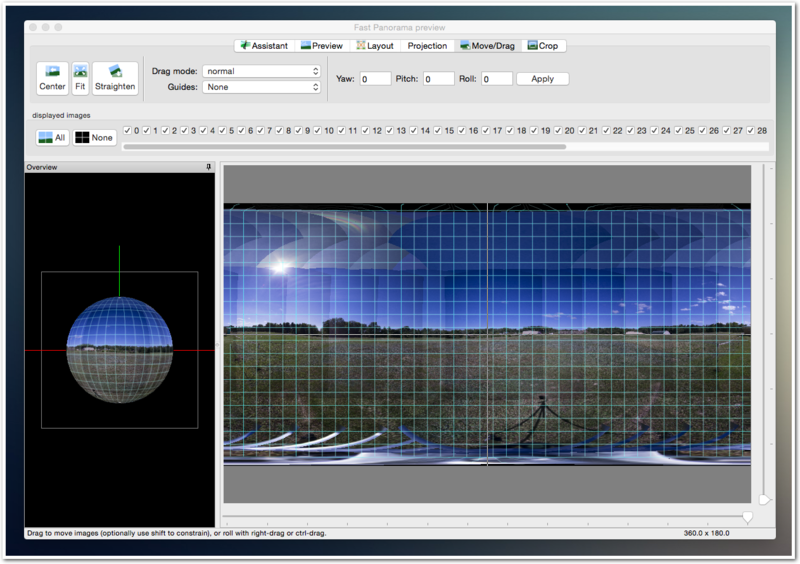 Use a panoramic head on a level tripod. Start with lens parallel to ground. Aim for horizontal center to be on horizon (where ground meets sky in the distance all around you). Take 360 degrees of shots, tilt up so ground still slightly in view but mostly sky in view, go 360 again, point downward but with some of original first 360 subjects still in view, go 360, do one shot straight up, and one shot straight down. Open Raw files in Lightroom. Set first photo white balance as desired. Change dropdown to “Custom”. Select all photos and sync. Remove chromatic aberration on first photo. Select all photos and sync. enblend will be used later to automatically correct the differences in the exposures. It does a brilliant job at this. 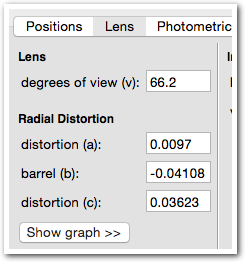 Lookup the distortion values for the lens you used. 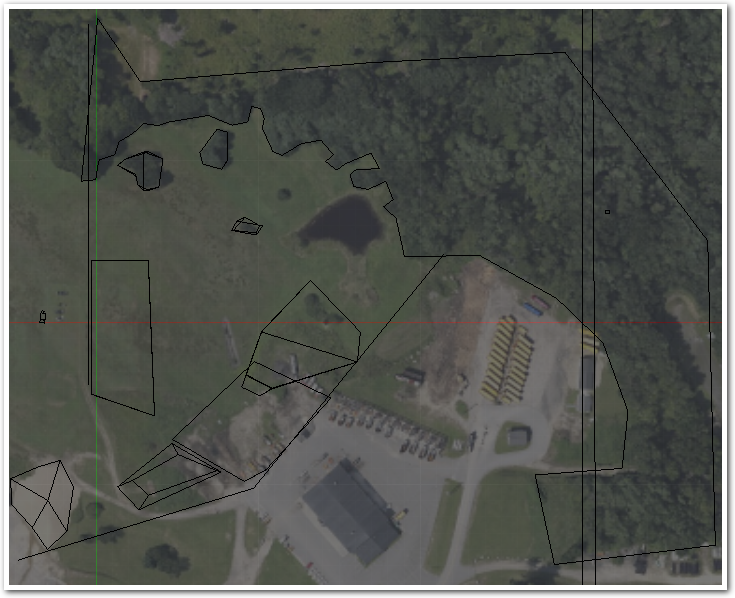 It’s important to provide this to Hugin for better processing. Add files to Hugin via Photos tab. If you have a lens ini file available, use it. 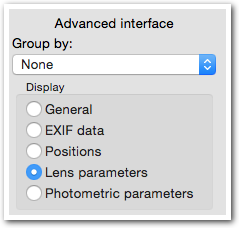 After using lens profile, verify Lens parameters are correct, then go back to General mode. You do this with the Advanced Interface pane on the right side of the application. You must enable Advanced interface for this to appear. Go back to the Photos tab and change Geometric to Everything (or whatever other option you want). Open the Fast Panorama preview again and re-inspect the results; if ok now, move on. If the panorama shots positioned well, proceed. Click and drag image at various points until horizon lined up and level across the photo. There are centered horizontal and vertical line. Use these to position the center of the photo and the horizon. You should drag different parts of the image to try to get as much of the ground-meets-sky line touching the horizontal center line as possible. Fill in the gap at the top. 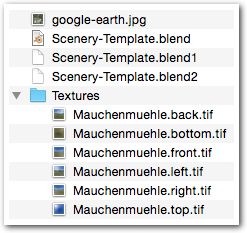 Etc… but avoid changing anything near the edges, because the blending won’t look right between the images if you do. Before you can try your scenery in neXt it has to be built. The neXt developer will convert your blender project into a .next scenery file. Wait patiently for a response. This is very helpful for working with blender. It helps judge distances much more accurately. Now, when you go to top view (hit 7)you will see the Google Map overlay. Using this you can more easily create objects in the right places. Zoom in and delete 3 of the points (unless you want to start with a square). Shift-Right-Click on the last point you made, and the first point so that they are joined. Transform and drag the “z” value up so that your shape becomes 3 dimensional. Your camera should always be at 0, 0, 0. 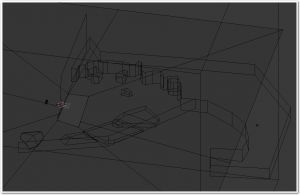 Before placing a new object, put 3d cursor where you want the object. (easiest to use google map overlay (top mode) to click for x,y. Then just update “Z” to 0. Ground and runway should be at -1.75m if your area is flat. If your land is not flat, you can adjust as needed. “b” is your friend — use it to select vertices, edges, and faces easily. Don’t judge positioning of objects from ANY VIEW except Top and Camera. You can get everything close with whatever views you want, but ultimately the Camera perspective is the one that matters, because that’s what you’ll see when you’re simming in neXt. So, when it comes time to check your work (let’s say you created a new cube that will represent a picnic table), first switch to camera view (hit 0), then hit SHIFT-f and move your mouse to look around. If it looks right from this perspective, it should look right in the simulator. While in edit mode, hit “a” to select everything. If you have things selected, hit “a” to unselect them. 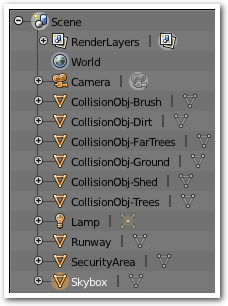 Split an edge (add a vertex) easily by clicking the knife tool in the tools bar. Click the first edge, then click a second edge, then hit enter. If you need an even split you can do something like switch to edge mode, right click the edge to split, hit Ctrl-R, move mouse to see options and click to create new edges. Moving objects on x,y is easiest by going to top view (hit 7). 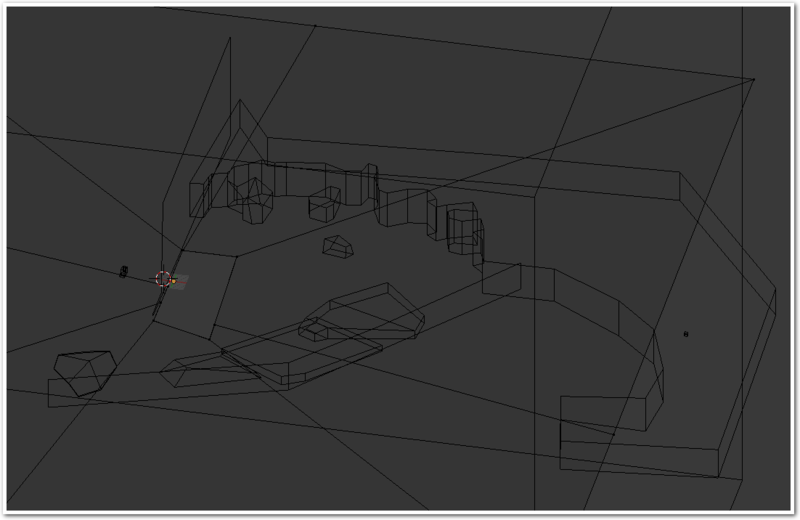 Make sure you’re using 3d manipulator (the colorful lines). Select the object or vertices, or edges, or whatever. Then just drag the arrows to move the selection. Runway is where the heli can land. CollisionObj-Ground is where the heli will crash if it hits the ground.